Deserts are places of creative adaptation. To deal with water shortages, high temperatures during the day and low temperatures at night, plants and animals have adapted some strategies to enable their survival. For example, the kangaroo rat has adapted to metabolize the water they need from dry seeds. Some desert plants have adapted to use needles, which are efficient at both water retention and photosynthesis. Some plants do without leaves or needles and rely on photosynthetic bark for food production. Plants adapt root systems which either spread wide to take advantage of infrequent rain events, or deep to tap into underground water sources. Some animals rest during the dehydrating heat of the day and forage for food only at night. Some animals burrow under the surface of the sand and allow prey to come to them, rather than expend the energy, and water, to search for food. Plants in the desert have even created a photosynthetic pathway, the CAM pathway, that is less efficient at creating food, but highly efficient at conserving water. Loss puts stress on our emotional, spiritual and physical systems. It can be like walking into a desert without proper preparation. It takes creativity to survive. People who live in the desert have adapted by moving frequently, called transhumance. They know routes through the deserts and where oases are to replenish their supplies. One of the perks of deserts is that you can see for miles, there are few things to get in the way of clear vision. The desert, with its hardships, is an excellent inner mirror for personal loss. What major losses have you experienced? How did you cope with these losses? 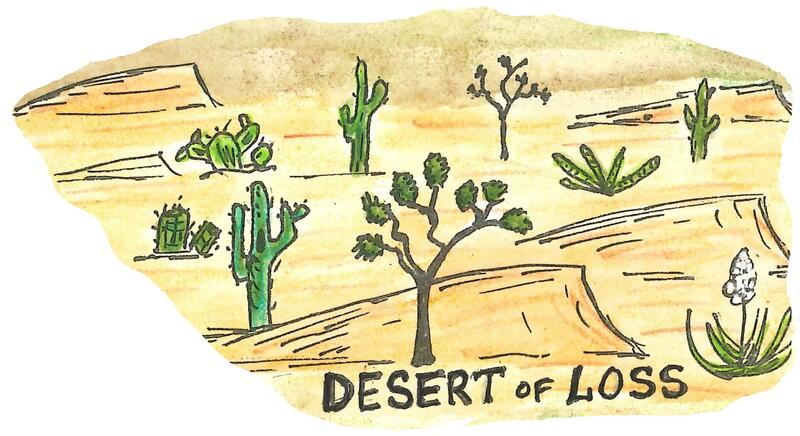 Where are the oases in your desert? How do you find and map them? What other elements in the land of loss? Is a desert an appropriate landscape type to explore your histories of loss, or do you think another landscape is more appropriate? How do we create “resilience” in this modern world? Do you compartmentalize your unpleasant experiences? How would you map this compartmentalization? Here is a gallery of interpretations of deserts as landscapes of loss. My deepest thanks to the artists who share their work on this page.